How’s the cookie making going over there? Maybe some candy happening on your counter? Dipping something in chocolate? Caramel in your hair? Good. Good. I’m glad it’s all coming together. And if it’s not, it will, it will. And if it doesn’t, it’s okay! We’ll all forgive you–we’ve got enough sweets anyway. Put your feet up and watch an old episode of Buffy or something. You deserve it. This is the time for all of that sweet inspiration–the internet is filled with cookies that will amaze and astound you. There are whole magazines on the news stand right now devoted entirely to the marriage of butter and sugar and flour, and then of course there’s that new book I’ve had on request form the library for a while now. It is a blogger’s responsibility to fill the month of December with giftable and sendable sweet inspiration, and I take that responsibility seriously. Except that I have some idea about what might really be going on over there. Maybe you are on top of your holiday baking and gifting, and you’ve knocked out 400 fleur de sel caramels today. Or maybe your days have just been filled with all of that stuff that December seems to be filled with–parent teacher conferences and holiday parties and days when it takes really long to get places because no one knows how to drive in the snow. Whatever you did, I’m guessing it kept you busy, and now it’s 5:30, and what the hell is for dinner? How about some pastry ends and left over cream cheese frosting? We need some decent dinner ideas, and we need them fast. I was talking to my friend Meg last week on the phone. Life’s been a little crazy for her lately, and a little more stressful, and she’s been having a bit of a time getting dinner out. We were talking about those fabulous things that involve ingredients that we almost always have, that are cheap and take 20 minutes and are so delicious that everyone is so excited that it’s that night, you know the night you didn’t have time to make something else. said, yeah there’s definitely carbonara, and then of course there’s pasta with lemon, sardines and capers, which is cheaper and faster and really truly only uses one pot. And I said, yeah, totally, like I knew just what she was talking about, like I had eaten it a million times. I was just going with the flow of the conversation. 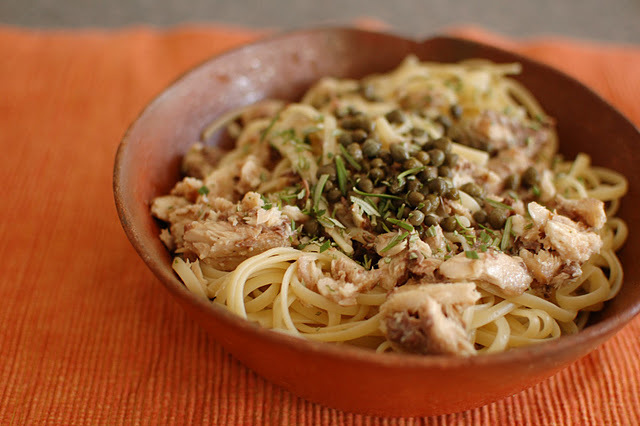 But afterwards I started thinking, and it kept repeating over in my head…pasta with lemon, sardines and capers. That’s right, PASTA WITH LEMON, SARDINES AND CAPERS. How come I’ve never thought of this? For days, I thought about it–it was in the back of my head like a little song, repeating over and over in a rhythm of ease and craving and dinner planning. Pasta with lemon, sardines and capers, pasta with lemon, sardines, and capers. And then it was dinner. PASTA WITH LEMON, SARDINES AND CAPERS! 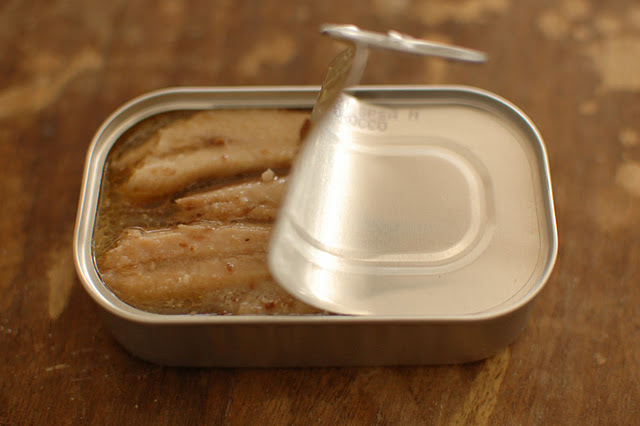 It’s possible that I’ve lost you with the sardines–I know it can happen. But if that’s the case, let me push a little on this one. Do you really not like sardines? Or are you confusing them with anchovies? Or do you just think you don’t like sardines? This would be a time to look deep inside yourself and get some answers. Because I’m offering you a dinner plan here, and it can be ready by six. I think it’s in your best interest to give it a try. 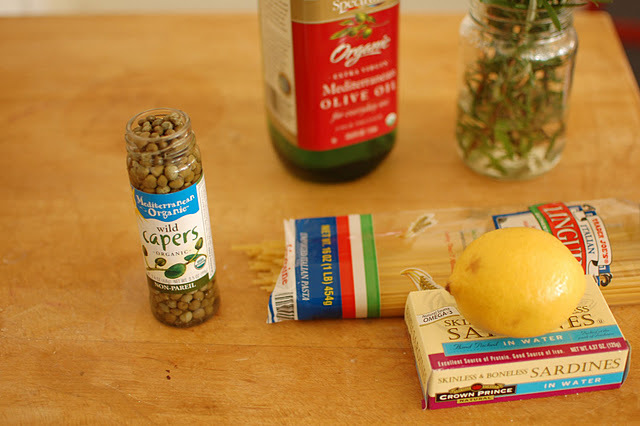 Because I bet you have a jar of capers in your fridge. And a lemon too. And maybe, just maybe, there’s a tin of sardines in your pantry that your cousin from France left when he was visiting last summer. I’ve always thought of sardines in the context of a sandwich. When I was a teenager I was handed my first sardine sandwich on white bread with butter and I never looked back. But this? This takes it to a whole new level. Besides being so so tasty, sardines are high in omega 3’s, low in mercury, and inexpensive to buy. In this age of dangerous fish eating, it’s a good idea to stay small–sardines and anchovies and smelts and those fish that are low on the food chain are your best bet. And on white bread with butter? Hoo-ray. And on pasta? I’m adding an exclamation point. Hoo-ray! Cook the pasta as usual. Drain, and toss with sardines, lemon juice, capers, rosemary if you’re using it, a few good glugs of olive oil, and a flurrying of salt and pepper. Taste, and either adjust the seasonings or keep on eating. Dinner is served.